The Bolek parasitology lab attended the Rocky Mountain Conference of Parasitology on September 5th-8th, 2012 held at Cedar Point Biologial Station in Ogallala Nebraska. 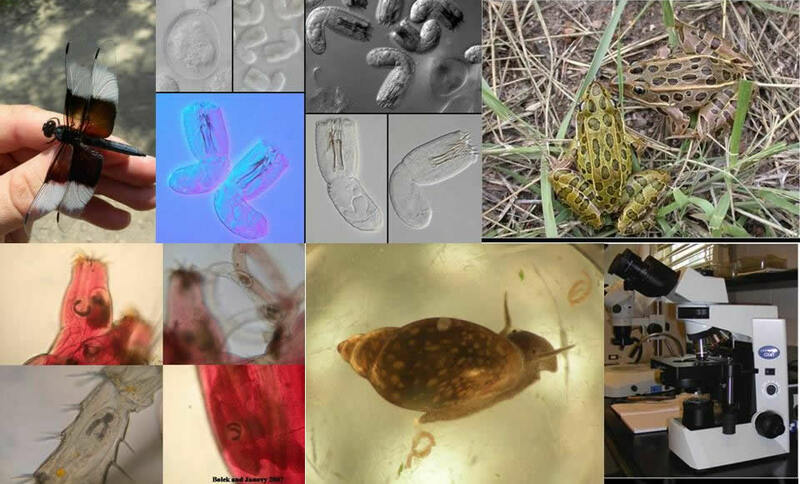 Three graduate students, one undergraduate student and Matt presented 5 talks and 2 posters on their research on amphibian and insect parasites. Ryan Shannon recieved the William C. Marquardt Award for Best Poster Presentation by an Undergraduate Studentrecieved and Crystal Wiles recieved the Datus M. Hammond Award for the Best Poster presented by a Graduate Studentat. Congratulations to both! It was a great meeting with over 75 people attending. Matt was also nominated as the president of RMCP for 2012-2013. News from the summer and previous year! As usual it was a busy summer/year in the Bolek parasitology laboratory. These are some of the activities that occurred. #1 Both Mr. Suhail Vhora and Ms. Cleo Szmygiel graduated with their MS degrees in May 2012! Congratulations! Ms. Cleo Szmygiel before her defence. The Bolek lab at Louie’s Bar and Grill (one of the local watering holes) celebrating Suhail’s successful defence. #2 Matt spent two weeks collecting hairworms in Mexico as part of their current NSF proposal on the biodiversity of hairworms in the New World. Matt was hosted in Mexico by Dr. Gerardo Pérez-Ponce de Leon's lab from UNAM, and the help of Dr. Agustín Jiménez from Southern Illinois University. Matt collecting invertebrates at a mountain stream in Mexico City, Mexico. #3 Over the last year, Matt and graduate students including Kyle Gustafson, Heather Stigge, Crystal Wiles, Suhail Vhora and Cleo Szmygiel present 25 talks on their research at the Rocky Mountain Conference of Parasitologists (RMCP), the Southwester Association of Parasitologists (SWAP), the Annual Midwestern Conference of Parasitologists (AMCOP) and the American Society of Parasitologists (ASP) in 2012. Heather Stigge received the Becker Award from SWAP, George R. LaRue Award from AMCOP and the Honorable Mention from the ASP for her talk on site fidelity of hemiurid flukes in anurans. Additionally, Kyle, Heather, Crystal and Cleo received research grants and travel grants from SWAP, AMCOP and ASP during 2011 and/or 2012. Heather and Kyle accepting their awards at SWAP. Heather Stigge accepting Becker Award from President Fedynich; Kyle Gustafson accepting Graduate Research Grant Award. #4 Bolek and Ben Hanelt from the University of New Mexico organized the first International Nematomorpha Symposium “From Immune Systems to Ecosystems and Everything in Between” in conjunction with the 87th Annual Meeting of the American Society of Parasitologists (ASP) at the Omni Richmond Hotel in Richmond Virginia. At this meeting a total of 17 presentations were made involving hairworms (14 oral presentations and 3 poster presentations). The symposium involved hairworm experts from: The United States of America, Germany, Japan, Taiwan, Argentina, and Georgia. Matt giving the introductory talk; all the participants in a group photo.